My husband’s favorite dessert is an apple pie and after buying about a hundred apples to test different pies and crisps for his upcoming birthday, I needed to put those apples to use in something a bit healthier. The first thing I thought of? 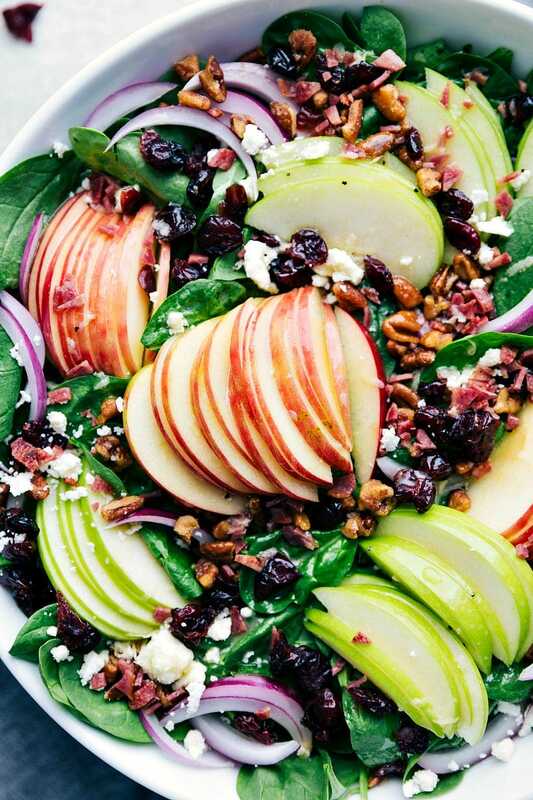 A Spinach Salad with plenty of apples, dried cranberries, and some turkey bacon to balance out the sweet. 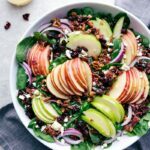 This salad is the perfect combination of sweet and savory with delicious and satisfying textures! 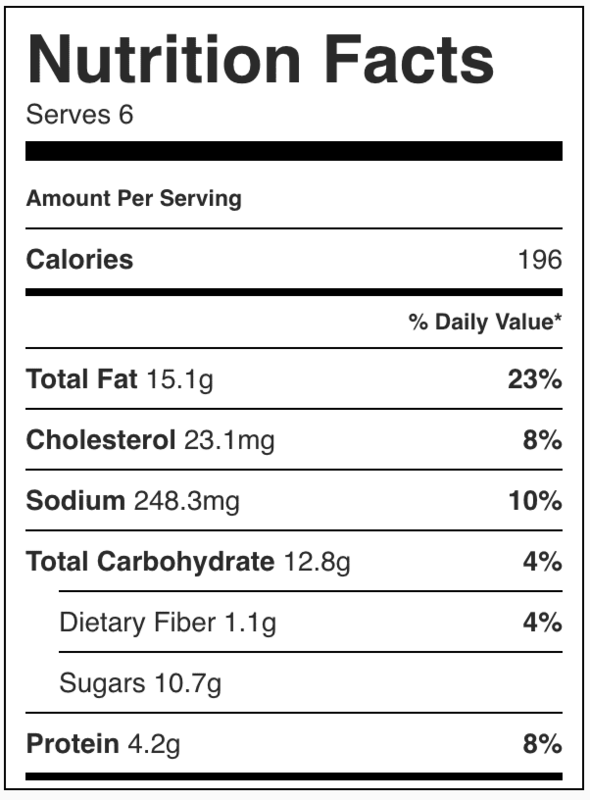 I LOVE pork bacon but don’t necessarily love all the fat, calories, and sodium that comes with it. ESPECIALLY if I’m looking to be a little healthier with a salad 🙂 Butterball Turkey Bacon is the perfect healthy alternative! 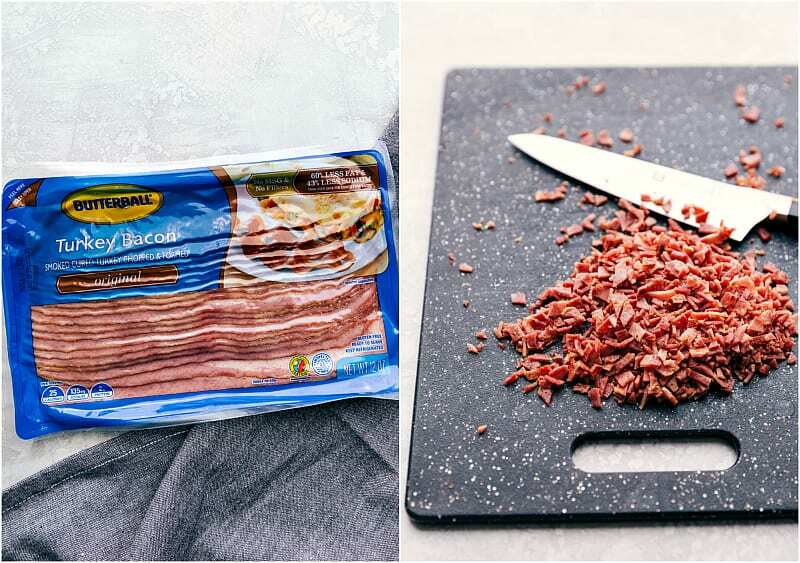 Butterball’s Turkey Bacon is full of flavor with approximately half the calories and 60% less fat and 43% less sodium than regular pork bacon . Next, peel and thinly slice one red onion. Then, coarsely chop the candied pecans. Again, to make this salad come together quickly you can buy pre-candied pecans OR make my favorite candied pecans ahead of time. You’ll then want to prepare your apples. Core the apples and slice them as thin as possible. Alternatively, you can chop the apples into small bite-sized pieces. While you can use any apples you’d like to, I like to use Fuji or Gala and a Granny Smith for both flavor and color. Toss all the above ingredients together along with the dried cranberries, feta cheese, and baby spinach. 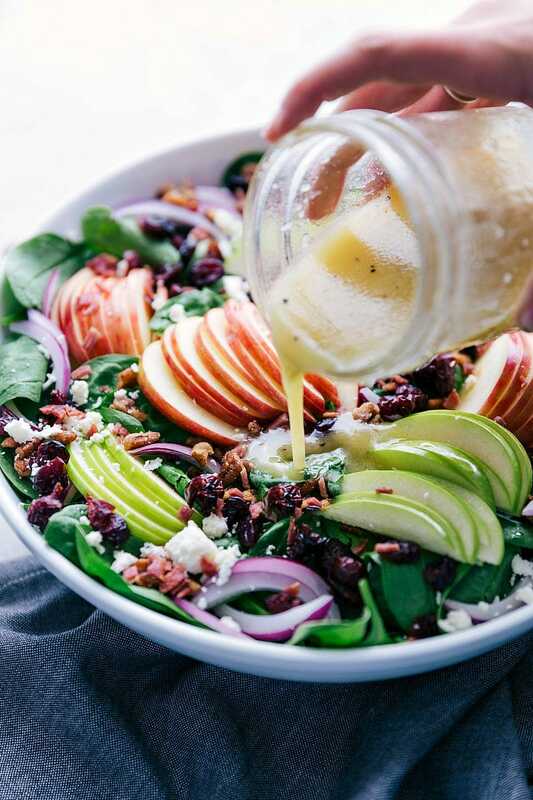 The dressing couldn’t be much easier to prepare – just place the apple cider vinegar, olive oil, maple syrup, Dijon mustard, and salt and pepper in a mason jar and shake to combine! This apple cider vinaigrette is going to blow your mind for how something so simple can be THIS delicious. Unfortunately not. The apples will start to brown if they are prepared too far in advance, the turkey bacon isn’t as crispy, and the dressing will make the spinach and other ingredients soggy. If you do want to prep in advance, I’d measure out and then store ingredients separately in plastic bags or small tupperware containers and toss them together right before serving. I’d quickly slice/chop apples right before eating (not in advance). The dressing can be made (and stored) in a mason jar 2-3 days in advance. Toss the spinach salad with ONLY what will get enjoyed the same day! What can I serve alongside this Salad? This Crockpot Turkey would be great served alongside, or some leftover turkey added into the salad. These Short Ribs or Crock Pot Roast would be great as a main with this spinach salad as a side. These Brussel Sprouts would make for a delicious side dish. 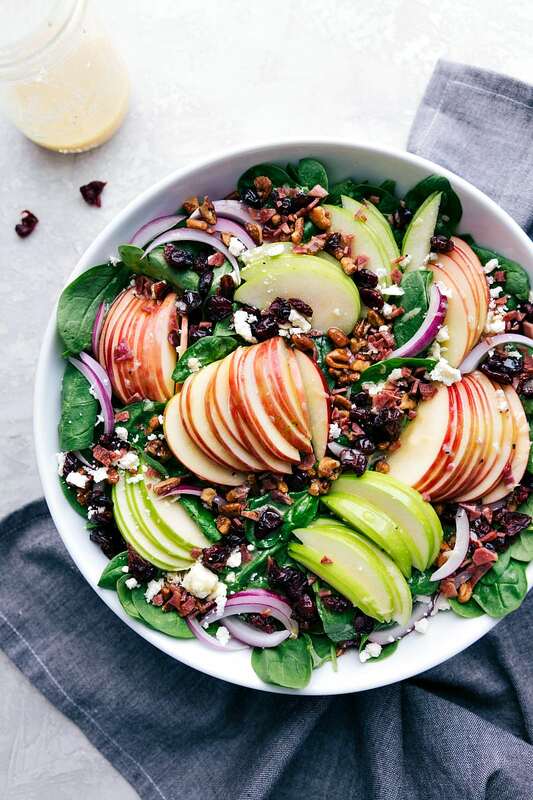 Add spinach, thinly sliced (or chopped) apples, thinly sliced red onion, pecans, dried cranberries, and half of the feta cheese to a large salad bowl. Toss with the prepared dressing (See step 3). Serve immediately, garnished with the remaining feta cheese and chopped bacon. This salad doesn't store well! If you do want to prep in advance, I'd measure out and then store ingredients separately in plastic bags or small tupperware containers and toss them together right before serving. I'd quickly slice/chop apples right before eating (not in advance). The dressing can be made (and stored) in a mason jar 2-3 days in advance. Toss the dressing with ONLY what will get enjoyed the same day! *You can chop instead of thinly slicing. To take away the "bite" of the red onion (make it more mild): submerge the sliced or chopped onions in a bowl of cold or ice water. Let them sit for at least ten minutes, stirring 2-3 times, and then drain and use in this salad.